The large serial slave display is a versatile display that accepts serial ASCII data from a host device and displays the received characters. The displayable data includes numeric, 7-segment alphabetic and certain punctuation characters. 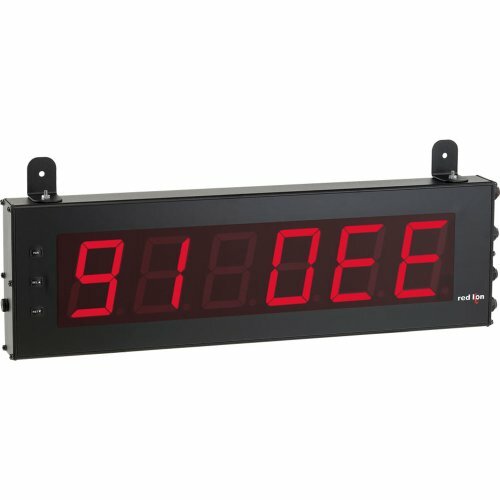 The 6 digit display is available in 4" high red LED digits with adjustable display intensity. The 4" high model is readable up to 180 feet. Constructed of a NEMA 4X/IP65 enclosure in light weight aluminum. The serial slave has two internal display buffers, allowing two separate display values or messages to be viewed. The main (primary) display typically shows dynamic data (count, rate, process, etc. ), usually received directly from another meter. The secondary display typically shows a fixed message or value, such as a system or machine identifier, or a target production value. The main and secondary displays can be toggled either manually or automatically at a user selected toggle speed. Both displays are retained in memory when power is removed from the unit. Power requirements: AC power 50 to 250 VAC 50/60 Hz, 26 VA, DC power 21.6 to 250 VDC, 11 W. 24-12 AWG copper wire. Aluminum enclosure, and steel side panels with textured black polyurethane paint for scratch and corrosion resistance protection. Sealed front panel meets NEMA 4X/IP65 specifications. Installation Category II, Pollution Degree 2. UL, CE, RoHS approvals.